Nichols Store, located in Rock Hill, South Carolina, started back in 1968 as a small country store primarily selling gas, grocery items and a small amount of fishing supplies. The store was owned and operated by Tommy “Papa Tom” Nichols from 1968 until 1989, at which time Tommy’s son, Darren, purchased the store. Now Celebrating 25 years, Darren Nichols has combined his experiences and love for the outdoors and expressed it by taking his vision into action and creating an outdoor retail store for the entire family. Nichols Store’s high ceiling, cedar paneled and trophy mounted walls, give our customers a warm friendly hunting lodge-like atmosphere. Through highly trained support staff, Nichols Store provides product expertise in all areas and is devoted to fulfilling all of your outdoor needs. Nichols Store sells hard to find name-brand products from hunting gear for all seasons, kayaks, clothing and footwear, firearms, ammunition, safes, archery, fishing, cutlery to Beautiful reclaimed wood furniture and Log Cabins by Legacy Quest Outdoors. We provide a wide variety of hard to find products for the outdoorsman in everyone. Separating us from the rest, we also provide Layaways and trades on firearms. In addition to Nichols Store, we also have Nichols Buggies and Nichols Processing on site. Nichols Buggies is the largest Bad Boy Buggy dealer around. With its full service and maintenance department we sell carts and trailers for hunting, home, business or the golf course. We have over 70 units available. We buy, sell and trade UTVs and ATVs. Nichols Processing has been around for over 25 years. Nichols Processing is a state-of-the-art wild game processing facility providing cutting, curing and smoke products. We process one at a time to ensure your wild game is YOUR game! To wow our customers even more, Nichols Store has an awesome Deli so you can eat and shop — all at the same time. We are a one-of-a-kind store specializing in treating our customers like part of the family! We are eager to serve you from sport to sport and season to season. 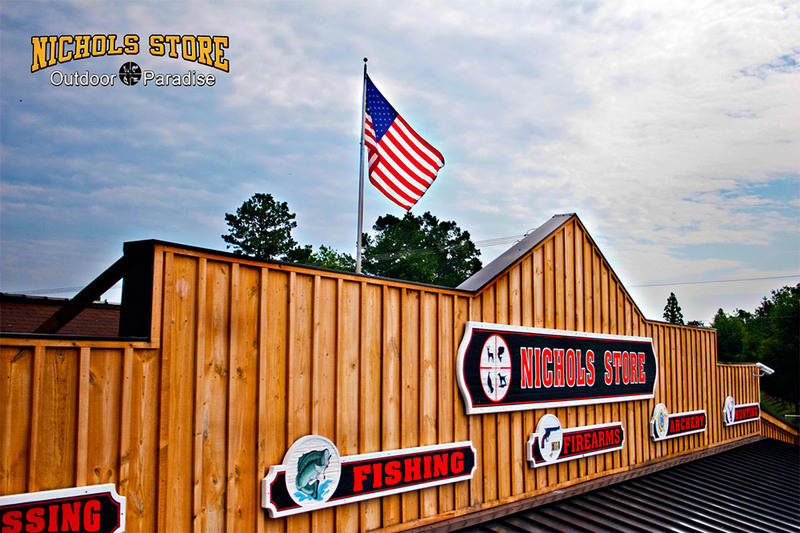 Whether you shop with Nichols Store in person or online, it’s truly the outdoor sportsman’s retail paradise for the entire family.